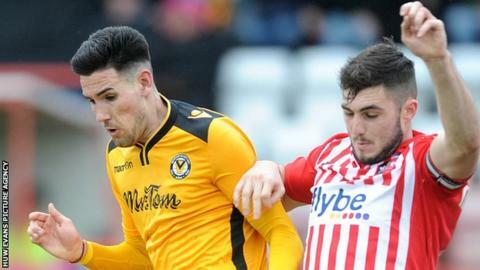 Scott Boden's late header gave Newport County a valuable draw away against League Two play-off contenders Exeter. Newport's Conor Wilkinson hit the post twice in a goalless first half, before Jordan Tillson met Lee Holmes' free-kick to put the hosts in front. Boden equalised with five minutes left as he headed in from close range for his 12th goal of the season. Exeter stay 13th in the table, while Newport are now seven points clear of the relegation zone. Match ends, Exeter City 1, Newport County 1. Second Half ends, Exeter City 1, Newport County 1. Substitution, Exeter City. Jamie Reid replaces Jayden Stockley. Attempt missed. Conor Wilkinson (Newport County) right footed shot from the centre of the box is just a bit too high. Attempt missed. Medy Elito (Newport County) right footed shot from the left side of the box misses to the left. Goal! Exeter City 1, Newport County 1. Scott Boden (Newport County) header from the centre of the box to the bottom left corner. Assisted by Medy Elito with a cross. Attempt saved. Scott Boden (Newport County) right footed shot from outside the box is saved in the centre of the goal. Dean Morgan (Newport County) is shown the yellow card for a bad foul. Foul by Dean Morgan (Newport County). Jayden Stockley (Exeter City) is shown the yellow card. Darren Jones (Newport County) wins a free kick in the defensive half. Ben Davies (Newport County) wins a free kick in the attacking half. Corner, Exeter City. Conceded by Medy Elito. Attempt blocked. Alex Rodman (Newport County) right footed shot from outside the box is blocked. Attempt missed. Scott Boden (Newport County) header from the centre of the box is just a bit too high. Hand ball by David Wheeler (Exeter City). Attempt blocked. Jordan Tillson (Exeter City) right footed shot from outside the box is blocked. Goal! Exeter City 1, Newport County 0. Jordan Tillson (Exeter City) left footed shot from the centre of the box to the top left corner. Assisted by Lee Holmes. Andrew Hughes (Newport County) is shown the yellow card for a bad foul. Darren Jones (Newport County) wins a free kick in the attacking half. Attempt missed. Troy Brown (Exeter City) right footed shot from the centre of the box is close, but misses to the left. Corner, Exeter City. Conceded by John-Christophe Ayina.